Your career dominates your life. You spend a significant portion of each day on your career. If you are in a career that you don’t like, it can make every aspect of your life unhappy. As a result, learning how to choose a career is one of the best things you can do for yourself so that you feel good about the work you do, as well as excel at it. Consider your values: Determine what’s important to you. What do you value? Fairness? Social justice? Earning more money? Flexibility? Family time? Think about the things that matter most to you. Then, take a look at career options that fit your values. Some people choose to teach because they have the same vacations as their kids. Others value status and money, so choose high-powered corporate jobs. People who like helping others often work in civil servant jobs or health care jobs. Decide what matters most to you, and try to find a career path that fits. Look at your talents and knowledge base: What you can do and what you know also matter. What are you good at? What skills and knowledge do you have? Compare your abilities and your knowledge to different career options. You can identify a few careers that might fit your values, and then dig into the requirements of those careers to see if they fit your skills, experience, knowledge, and education. Be realistic about your situation: In some cases, you have to be realistic about your situation and what you can do for a career. When you get down to it, part of how to choose a career also depends on the realities of your situation. Do you have the time and money to get the education and/or training you need for a particular career. The important thing is to have a clear idea of what is expected in different careers. In some cases, once you choose a career, you can jump through the necessary hoops to make it happen. But it’s vital that you understand what you are likely to enjoy, and what fits with your values, before you get started trying to figure out what career to try for. 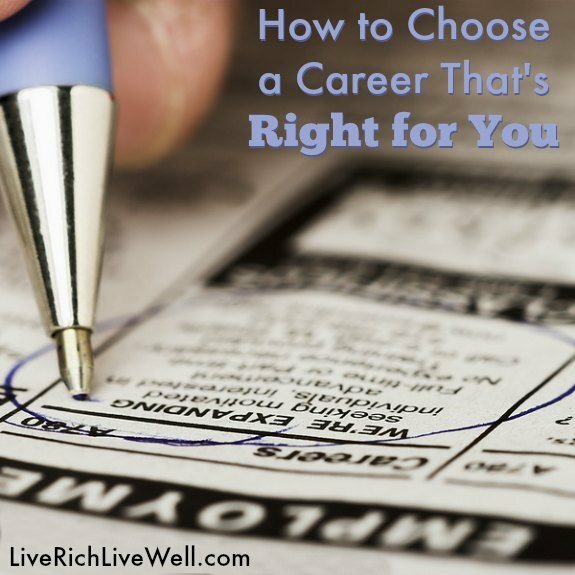 Even if you can’t get into the “perfect” career, it is often possible to choose a career that you are reasonably satisfied with. And, even if you don’t start out in the perfect career, you can use your current job as a way to build experience, and learn what you want to accomplish later. Use it as a time to figure out what you want to do, find out what the requirements are, and then make a game plan to change careers once you have the chance.